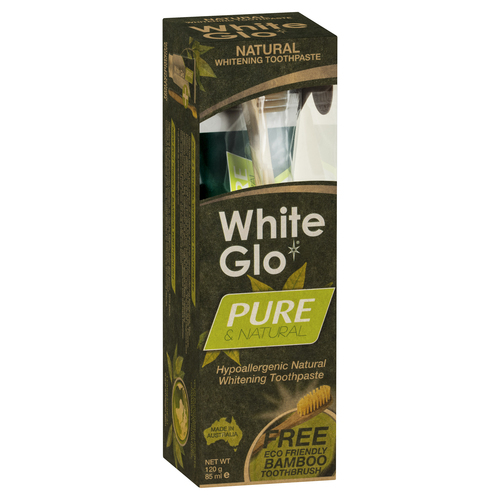 White Glo, Australia’s number one tooth whitening brand are pleased to introduce a brand new tooth whitening toothpaste to the UK: White Glo Pure & Natural. White Glo’s Pure & Natural is a healthy and safe, natural whitening toothpaste. This premium all-natural whitening toothpaste is free from harsh chemicals, fluoride, peroxide, and bleaches. It’s also vegan, gluten-free, and made with organic ingredients. Most toothpastes contain Sodium Lauryl Sulfate (SLS), a chemical used in toothpaste to create the foaming action. SLS can cause or irritate existing allergies, and even trigger bad breath. Many whitening toothpastes contain hydrogen peroxide to bleach your teeth however peroxide and other bleaches can erode the enamel on your teeth which keeps them strong, and extended use can lead to long-term damage. Triclosan is also another nasty chemical found in toothpaste which has been linked to causing cancer. Pure & Natural uses a unique blend of natural ingredients to whiten your teeth without using these chemicals. Following years of research by dentists, the White Glo products are formulated with the same ingredients used by dentists in clinics to achieve fast effective results. The natural cleansers and whitening properties in this formula help to gently remove stains, yellowing, and plaque from your teeth enamel without damaging it. Each pack comes with a FREE eco-friendly bamboo toothbrush. White Glo is the Australian Oral care brand, which has been rated No. 1 most effective whitening toothpaste by a leading independent trial and has the Seal of Approval from the Australian Dental Association. White Glo was first established in Australia in 1993 and was the first company to introduce teeth whitening products to the Australian market. White Glo is one of the market leaders in Australia’s whitening toothpaste and teeth whitening industries. White Glo products are now sold in the United Kingdom, South Africa, Russia, Singapore, China, Hong Kong, Japan, Middle East, New Zealand, Papua New Guinea, Greece, Philippines and Cambodia.